An exciting game between Top Four teams was played in Johannesburg. Leader Magic faced 3rd placed Limpopo Pride. Guests from Johannesburg (7-0) smashed host Limpopo Pride (6-3) 79-57. It ended at the same time the three-game winning streak of Limpopo Pride. Undefeated Magic have an impressive series of seven victories in a row. Defending champion maintains first place with 7-0 record. Limpopo Pride at the other side keeps the third position with three games lost. Both teams do not play next round, which will be an opportunity for some rest. Eagles can celebrate finally their first win this season after eight consecutive losses. They used home court advantage to defeat N.C. Zebras (1-6) 54-51. Eagles maintains eleventh place with 1-8 record. N.C. Zebras at the other side keep the tenth position with six games lost. Eagles' supporters look forward to an exciting derby game next round, where their team will travel locally in to the arena . 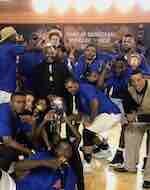 Undefeated leader Magic delivered the seventh consecutive victory on Friday night. This time they crushed 8th ranked Rhinos (3-7) 93-54 in Mbombela. It ended at the same time the two-game winning streak of Rhinos. The victory was the seventh consecutive win for Magic. Defending champion maintains first place with 7-0 record. Loser Rhinos keep the eighth position with seven games lost. Both teams do not play next round, which will be an opportunity for some rest. The game with biggest result difference took place in Johannesburg. Local Panthers (7-1) outscored 9th ranked E.C. Windbreakers (1-5) 91-40. The victory was the third consecutive win for Panthers. They maintain second place with 7-1 record having just one point less than leader Egoli Magic. E.C. Windbreakers lost their fifth game in a row. They keep the ninth position with five games lost. Both teams do not play next round, which will be an opportunity for some rest. N.C. Zebras were crushed by W.C. Mountaineers in Cape 98-63. Tshwane S. smashed E.C. Windbreakers at home 77-58. Limpopo Pride won against NW Eagles on the opponent's court 59-48. There was no surprise in Cape where 10th ranked N.C. Zebras (1-6) were crushed by sixth ranked Mountaineers (4-2) 98-63. Mountaineers moved-up to fifth place. N.C. Zebras at the other side keep the tenth position with six games lost. Mountaineers' next round opponent will be Marlins (#7) in Kwazulu. N.C. Zebras will play on the road against Suns in Tshwane and hope to win that game. An exciting game between Top Four teams was played in Johannesburg. Leader Magic faced 3rd placed Limpopo Pride. Guests from Johannesburg (7-0) smashed host Limpopo Pride (6-3) 79-57. It ended at the same time the three-game winning streak of Limpopo Pride. Magic have an impressive series of seven victories in a row. Defending champion maintains first place with 7-0 record. Limpopo Pride at the other side keeps the third position with three games lost. Both teams do not play next round, which will be an opportunity for some rest. No shocking result in a game in Tshwane where fourth ranked Suns (5-1) smashed 9th ranked E.C. Windbreakers (1-5) 77-58. The victory was the fifth consecutive win for Suns. They maintain fourth place with 5-1 record. E.C. Windbreakers lost their fifth game in a row. They keep the ninth position with five games lost. Suns' next round opponent will be N.C. Zebras (#10) which should be theoretically an easy game. Very expected game when 11th ranked Eagles (1-8) were defeated at home by third ranked Limpopo Pride (6-3) 59-48. 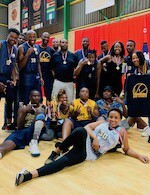 The victory was the third consecutive win for Limpopo Pride. They maintain third place with 6-3 record behind leader Egoli Magic. Eagles lost their eighth game in a row. They stay at the bottom position with eight games lost. Both teams do not play next round, which will be an opportunity for some rest.